Restylane, Juvederm and filler injections tips for physicians running medical spas and laser clinics. The following is from a string of emails that were circulating among some of Medical Spa MDs Members. I've edited this somewhat to make it readable and get rid of all the extraneous copies. I'm also not displaying the identity or email addresses of the physicians in this thread. Please leave your thoughts below as a comment. Note: Some of the comments below might be out of order from the original thread. Emails' somewhat difficult to follow as a thread but you'll get the gist. 1. When I use the "push ahead" technique, I feel that I get better "plumping" per cc of filler. I learned this from Kevin (thanks Kevin). 2. When I use the "push ahead" technique, the filler fills a few millimeters in front of the needle tip. You need to realize this to be able to put the material exactly where you want it. Sometimes you have to "feel" the injection because you can't "see" the plumping. 3. I mix 0.1 cc of lidocaine with epinephrine with my Juvederm. This helps with bruising (epinephrine) and when the lidocaine goes away and the Juvederm attracts water, the two effects cancel each other and there is not as much enhancement after the injection due to the hydrophilic nature of the Juvederm. 4. I use Juvederm Ultra under the eye and above the lip. I use Juvederm UltraPlus everywhere else. 5. I constantly complain to my Juvederm Rep about the 0.8 cc syringes. I use lots of Radiesse because you get almost twice as much material for the same price. Volume, volume, volume. Please complain to your rep, maybe we can get them to change. 6. I hear the Evolence is very good. We will be getting trained and start using it next month. This syringe allows you to get very precise amount of lidocaine (swish back and forth 20 times). Jeff: --"Push ahead" has a higher risk of vessel cannulation & potential for vascular effects - skin necrosis in glabella, even potential for retro-grade flow to eye (causing visual loss). I wouldn't recommend that technique for the periorbital area. 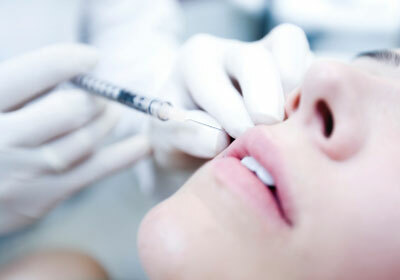 1) There are some areas that one has to still do the retrograde injection either b/c the purpose was to make a straight line (eyebrow lift and vermillion border and the bow-tie (the vertical lines connecting the base of nose and the upper lip border) AND when injecting the most inner 1/3 of the tear-trough to avoid risk of filler getting into the orbital space due to its close proximity to the orbital rim. 4) One can inject even Radiesse and/or Perlane via an 1/2 inch 30 gage needle. Why is this noteworthy to mention?? When I work on the lips and Marrionette's lines, I ususally first build the Vermillion border with Radiesse or Perlane (I get the best "lifting outcome" with heavier filler). I push the 1/2inch needle all the way forward then slowly and steadily inject while withdrawing (retrograde method). Then I re-evaluate how much of a correction I already get of the Marrionette' line and lifting up of the lip body. My next step is to inject into the most lateral lip section (about 1 cm distance) starting at the corner (using Perlane or Restylane or Juverderm). This time I inject slowly as I push forward (anterograde). Often I ended up correcting about 50% of the marrionette's line by going after the lip's border and most lateral body. Besides, the patient loveto see that they now could see their lip body all the way to the corner and more "smiley shape". The last step is the trickiest one, I use either Radiesse or Perlane on an 1/2 inch 27 gage needle. First placing my left thumb at the patient's lower half NLF's I retract the skin upward (about 2-3cm upward) then I approach my needle in an upward (vertical) position at about one centimeter lateral and one cm below the mouth corner of that same side. Then I aim diagonally toward the corner and start injecting anterograde just 1-2 mm below the imaginary horizontal line of the mouth corner (about 0.2 cc), then I withdraw the needle and reaim straight up and inject just below the horizonal line (0.2cc) then I do it one more time aiming diagonally outward (0.2cc). What was I attempting to do?? I was laying down a new flooring along the imaginary horizontal line. After the injection, release the left thumb. You will be surprised to see the retracted portion just rest right along this new floor, thus the Marrionette'line has been corrected. This is different from the common fanning technique of using the filler to "blow up" around the Marrionette's line. If you look carefully at those company's issued photos, the area around the Marrionette's line now appeared very swollen and puffed up. It is aesthetically unpleasant. It looked like the patient was beat up below the mouth. It reduced the profile of the chin. 5) For those of you that use fillers on the highly vascularized and shallow areas such as the temporal, crow's feet, undereye area lateral to the submalar area and along the lateral border of the cheek prominence (especially in those older skinny Caucasian ladies with much excessive very thin skin) I now emulate the same technique used in the hand. I would pinch to levitate the skin itself above the bony structure, then I bolus Restylane into the empty space. Then I massage it down. This elimates the risks of injecting into the vessels and nodules. Interesting discussion. So Kevin, how do you account for the difference in that anterograde injection you need less filler than in retrograde injections, assuming all else being equal? Second, I am understanding one group claims anterograde injection carries a higher risk of vessel cannulation and possible intravascular injection, while another group claims that anterograde injection "pushes away" blood vessels, thus decreasing the risk. Not sure how anterograde increases risk of intravascular injection any more than retrograde. If you push the needle ahead, transfixing a vessel, then begin injection, you can still conceivably deposit some material intravascularly, can you not? Am I missing something here?